Leeks are cousins to onions, shallots, garlic and scallions. 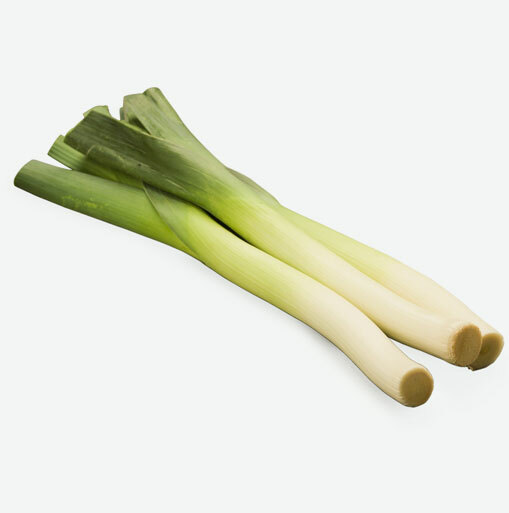 A leek looks like a large green onion; it has a very small bulb and a long white cylindrical stalk of layers on top of layers which are wrapped tightly in a delightful green bundle. Since leeks are related to garlic and onions, they contain many of the same beneficial nutrients that are found in those vegetables. Leeks lower LDL cholesterol (the “bad” cholesterol) and raise HDL cholesterol (the “good” cholesterol). Include leeks in your diet and help your cholesterol levels get to a healthy level. Include leeks or vegetables such as onions, garlic, shallots and scallions three to four times a week in your meals and help maintain your prostate and colon health. The greens of a leek should be strong–not wilted–and free from blemishes. When you’re ready to use your leeks, give them a good washing. Dirt and grime gets trapped in between the leaves, especially at the base of the plant where the stalk just turns green. Rid leeks of dirt by filling a basin or bowl with warm water, dunking and swirling them around and allowing the dirt to sink away. Once your leeks are washed, remove any outer leaves that are older and tough looking and trim the ends off both ends of the plant. Leeks will exude an aroma that can be absorbed by other things in your refrigerator, so to store them before cooking, lightly wrap them in plastic wrap to contain the odour and moisture. Do not trim or wash before storing. Store in the vegetable drawer of your refrigerator. Leeks will keep for up to three days in your refrigerator. Leeks can be cooked and served whole, sliced, diced, or chopped and added to salads, soups, casseroles, quiches, and mixed vegetables. Bake leeks into breads such as pizzas and focaccia or braise them with some fennel and chicken stock. Never overcook leeks, or you’ll end up with a slimy, mushy mess. Cook them just until they are fork tender and serve right away.